Our family tree has roots planted deeply in the fertile soil of Old Mission Peninsula. Our founding fathers were born and bred here and have come back home after seeing that the bright lights of the big city can’t shake a stick at the spotlight of the North Star on Grand Traverse Bay. It’s a story worth remembering — and retelling around the fire. Built in the 1880s and remodeled in the 1920s as a summer retreat for Chicago lumber baron J.W. Stickney and his wife Genevive, Bowers Harbor Inn Estate sits peacefully along West Grand Traverse Bay amidst the majestic oaks and pines of Old Mission Peninsula. After years as one of the Midwest's most respected fine dining destinations, Bowers Harbor Inn was purchased in 2006 by Jon Carlson and Greg Lobdell, two natives of Old Mission Peninsula. It is the goal of Jon and Greg to renovate and preserve the Inn as a historic site and award-winning restaurant. From the outset, their intention was to protect the Inn, and after years of hard work, the estate is now preserved in perpetuity! To achieve this, the Carlson and Lobdell Families worked closely with the Grand Traverse Regional Land Conservancy and the Michigan Historic Preservation Network to donate the development rights on the property, and placed a conservation easement that protects the historic, scenic and shoreline characteristics of the property. Northern United Brewing Company now calls The Bowers Harbor Inn property its home. The new distillery is housed behind the historic Inn. 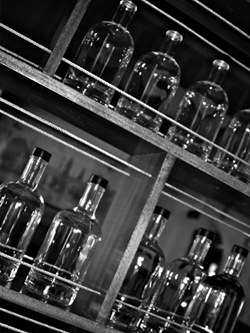 Civilized Spirits are created in our secret forest hideaway on the Old Mission Peninsula. The site has a long tradition of distillation! Spirits have been made on the site since the late 1800's when it was built by lumber baron J.W. Stickney and his wife Genevive. Civilized continues the long-standing tradition and we are proud to continue that legacy and bring it to you. his hair. Although the grizzlies may be gone, the dedication and appreciation of artisanal spirits lives on in every Civilized Spirit we hand-bottle.